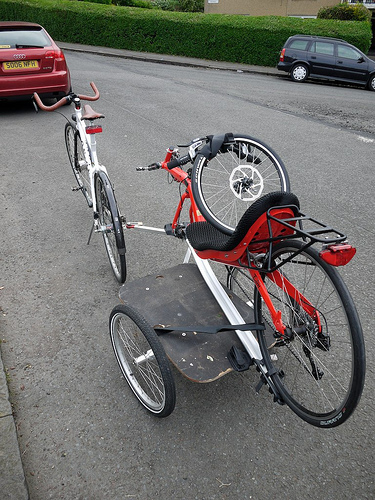 I previously wrote about transporting a bike on my Carry Freedom Y-frame. 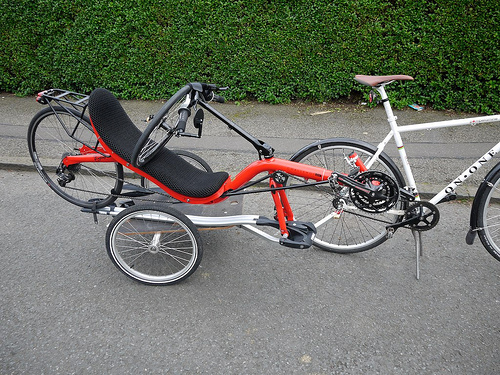 Yesterday I went a step further and moved a recumbent – a seriously large load and one with plenty of sharp edges! This is Laid-Back’s Challenge Fujin SL, which I wanted to drop off at the showroom without having to walk back (as I’d have had to if I rode it up). 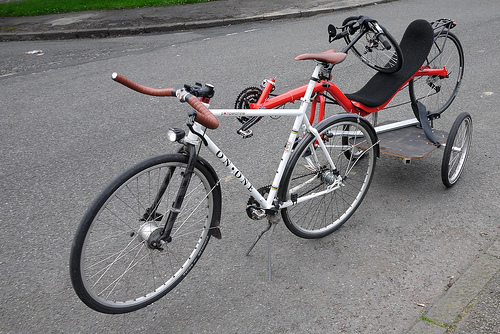 Riding like this with a strongly asymmetric load isn’t very good, mainly because the y-frame trailer itself doesn’t weigh much, so it’s easier than you’d think to tip over. I managed to avoid this through careful riding, then promptly forgot all about towing a trailer at all when I got into Marchmont, and slammed my shin into the bare chainring while dismounting… oops! It goes without saying that an extended towing hitch would allow a more sensible tow – I just haven’t got over the idea of paying almost 1/3rd of the trailer cost for a piece of square-section that’s been bent in a couple of places (however precisely!) just to carry outsized loads once in a blue moon.